For the first time in four years, all four of my kids will be heading off to school in the fall. As a work at home mom I’ve had lots of time to spend with twins, so I’m excited for them to start this next stage. With the twins starting preschool, I wanted to send the kids off to school in a BIGGER way to mark the occasion. These BIGGER Morning Muffins are put huge grins on their faces. Honeycomb, the sponsor of today’s post, believes thinking big is not big enough. They want fans of the classic cereal to join them in thinking as BIG as they possibly can, by making breakfast “biggerer” than ever before. These BIGGER Morning Muffins are “biggerer” than the typical morning muffin, and they top the delicious scale. 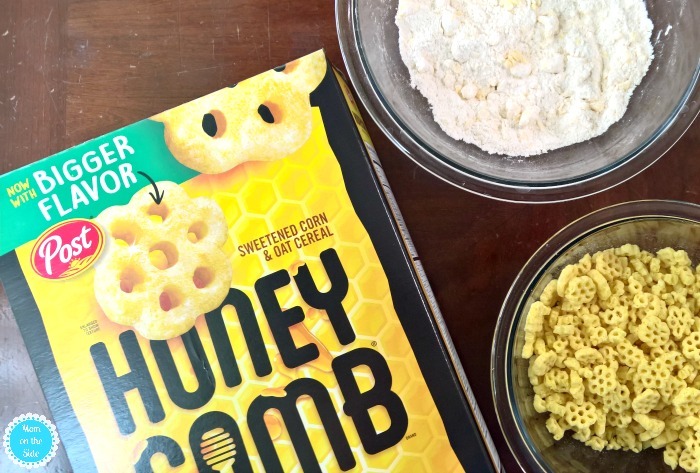 That’s thanks in part to Honeycomb, which combines sweetened corn and unique hexagonal shapes with big honey flavor. 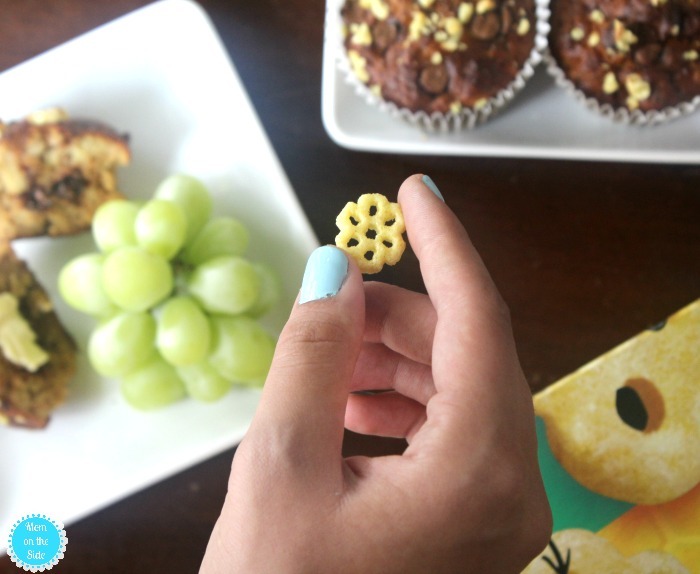 A staple for kids and cereal lovers nationwide, and now muffin lovers, too. Yes, I took those beautiful looking hexagonal shapes and I crushed them up into a tasty pile for muffin mix. Actually, I let the twins do it because kids love to break things. 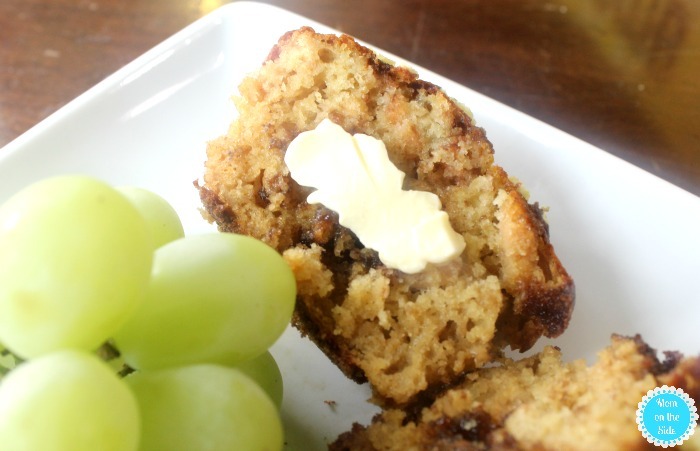 These BIG Morning Muffins are pretty easy to make too. In one bowl, mix together flour, sugar, baking powder, and salt. Then cut up cold butter into it and mix it all together with knives until is clumpy. In another bowl mix together Honeycomb, milk, and egg. Finally, mix both mixtures together and toss in some chocolate chips. 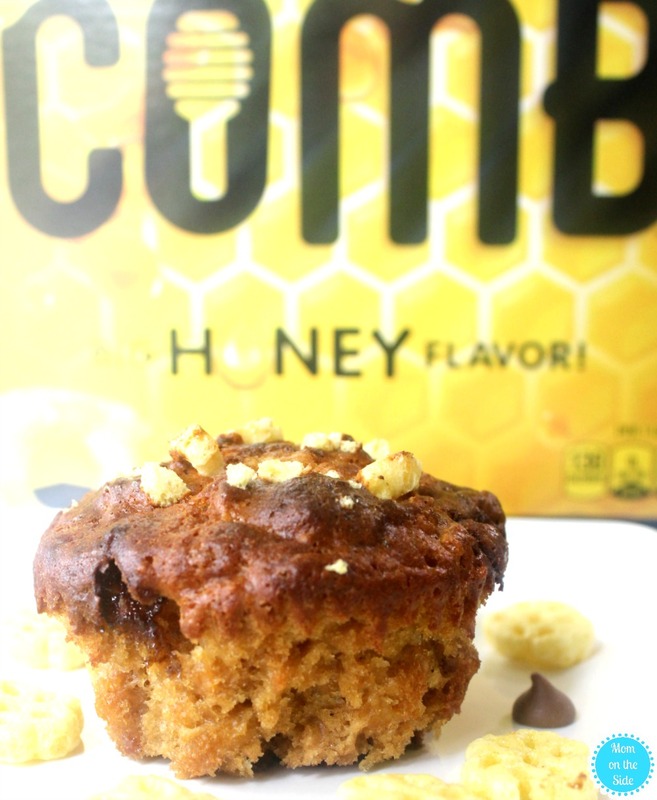 Fill a big muffin tin for 6 muffins and sprinkle crushed Honeycomb and cinnamon/sugar on top. Pop them in the oven at 400 for about 15 minutes, or until they are golden brown. Cut in half with a slice of melting butter…yum! They have a banana bread texture to them, hence the darker color on the top and inside. 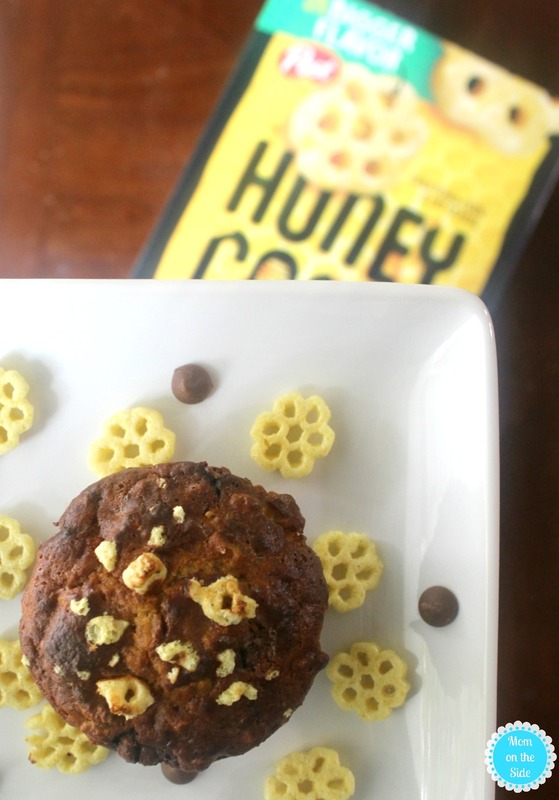 These morning muffins, just like Honeycomb’s one-of-a-kind big shape and big honey flavor, are sure to brighten up any breakfast or after school snack. I’m thinking of making a double batch on Sunday mornings and freezing half for the kids to grab out during the week. As you stock up for back to school, add Honeycomb to the shopping list because classics never go out of style! 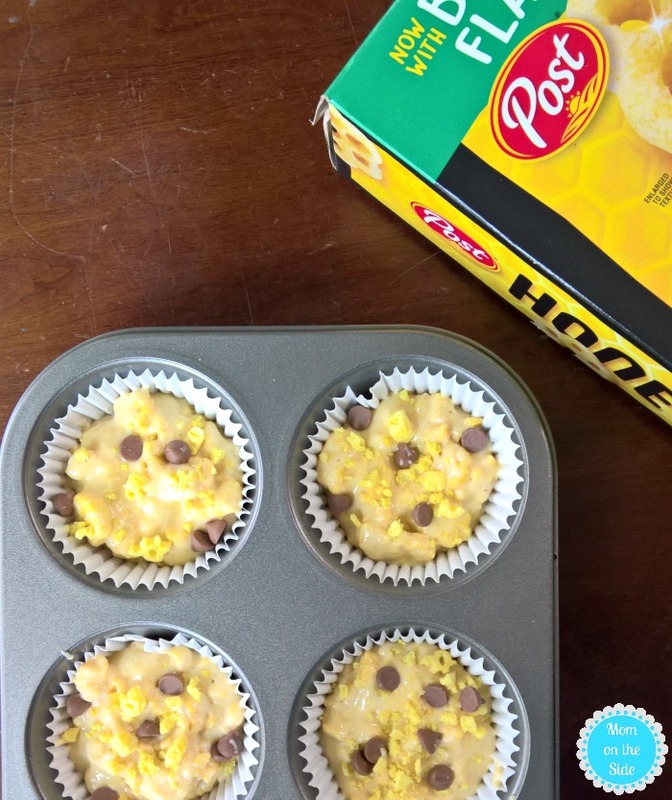 Thanks to Post Cereal, one Mom on the Side reader is going to WIN a box of Honeycomb and a $25 gift card! I don’t see the Rafflecopter. By telling her that anything is possible if you believe and work hard enough for it. I teach them to believe in themselves and to follow their dreams. 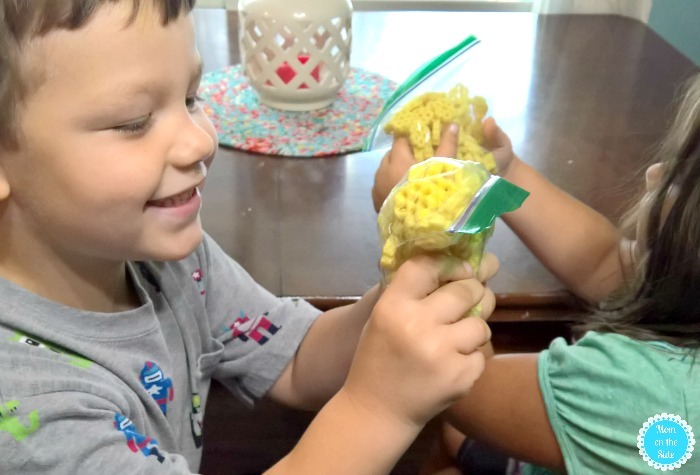 I teach my kids to think bigger by making delicious healthy meals and have healthy snacks. We love eating cereal for breakfast. I encourage my son to read to learn more and to think outside the box. I encourage my kids to dream big. I teach them to be kind, considerate, and to show and understand compassion. I tell my Grands to always do their best. I try to always be encouraging and let my kids know that their opportunities are endless. I encourage them to think bigger by letting them know they can do and be whatever they want and encourage them to be involved with lots of things! I teach them to try and problem solve by themselves and treat others with respect. I teach them to think biggerer by staying positive and standing up for themselves. I encourage the kids to think bigger by letting them know that they can be anything they dream of being. By telling them that they can do it and not let other people discourage them just because those ppl couldn’t do something.